A day after his passing, our image of the week commemorates Nelson Mandela. Nelson Mandela is one of the great leaders. Born in 1918, he went on to play a major role in the anti-apartheid movement within South Africa during the era in which blacks were massively discriminated against by the white minority. Mandela was caught by the authorities in 1962 and would not see freedom again until 1990. 18 of those years were spent in the infamous Robben Island prison. Nelson was eventually released on February 11, 1990. Our image of the week captures that moment. In the photo he is beaming following his release, as well he might. 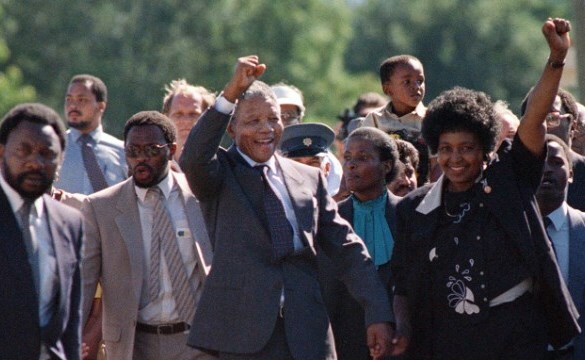 He is also triumphantly raising his fist with his wife Winnie by his side. One can but imagine his emotions. Decades in prison in exchange for a basic human right. Of course he eventually got what he wanted as blacks were given political equality; he then went on to lead South Africa. And despite the pain he had suffered over his years in jail, he preached forgiveness and brought his country together.